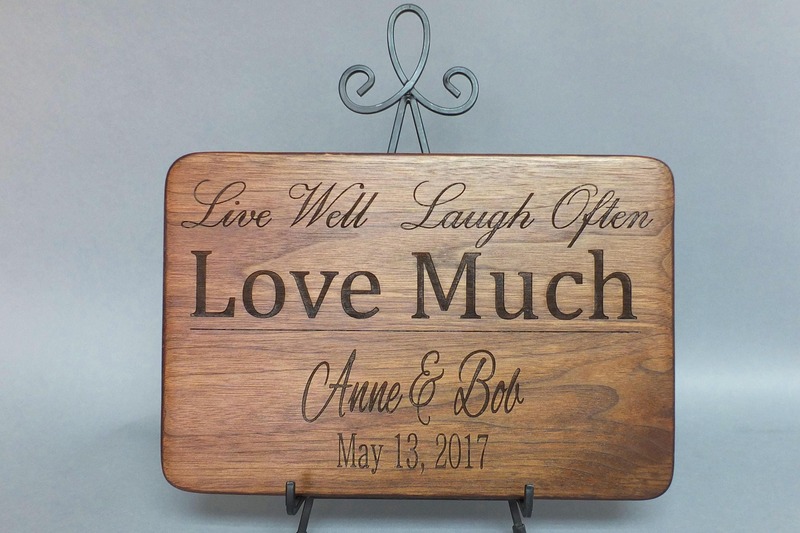 This beautiful Live Well Laugh Often Love Much wooden cutting board makes the best wedding gift, merticulously engraved with the couple's names and wedding date. Our personalized cutting boards are laser engraved on beautiful North American hardwoods in your choice of walnut, cherry, maple or white oak. The engraved side is for display purposes while the other side is for chopping. The corners are flawlessly rounded and all surfaces sanded to reveal the beautiful wood grain. You have the option of adding an easel to display this beautiful board and save counter space, or add our board butter to maintain the beauty of the wood. Please leave the exact spelling of the couple's name and wedding date in the 'note to seller' upon checkout. Ships in 3-5 business days. Handmade in the USA. 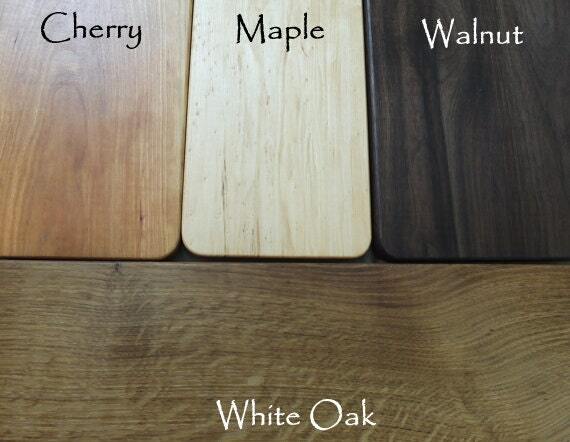 WOOD: Our boards are made from natural high grade hardwood and are never stained! As such, there will be board-to-board color variation, so please browse our listings to see the variety of color. We purchase each piece of wood we use and prepare each board in our shop to ensure the highest quality product possible. We control every step of the creation process to give you the highest quality, most sustainable material available. We progressively sand our boards to produce a beautiful, smooth surface, then treat with mineral oil and beewax to seal and finish. This capability also enables us to make any design in any size. Let us know if you need a custom size. All of our cutting boards are nominally 3/4” (0.75 inch) thick. Please allow for small size variation due the handmade origin of our boards. We will sometimes use wood that is thicker than 3/4” if the board allows. Let us know if this dimension is critical. Our cutting boards are engraved using a laser. 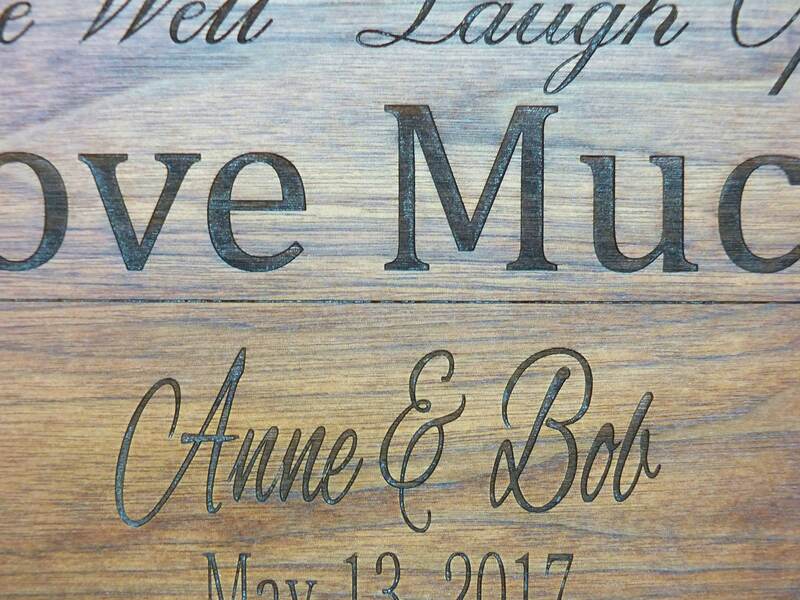 The color of the engraving is dependent on how each particular piece of wood reacts to the laser beam. If you would like to see a proof of your artwork before it is engraved, make sure to indicate this in the “Add an optional note to seller” field. We will send you a proof for approval via Etsy message only! Delays in response to our proof will delay the creation of your board, please keep this in mind! We will handwrite a personal note according to your instructions and include it in the package. Just indicate what you would like in the 'note to seller' upon checkout. If you live in the Midland/Bay City/Saginaw area and want to pick your item up, use the coupon code PickupOnly and you will not be charged for shipping. We do not deliver, you must pick up your item. If you have any questions, simply hit the "Ask a Question" button beside the price and we will get back to you within 1 business day! We can also make any type of board design in any size, so please let us know if you have a custom request. We specialize in custom products and can personalize any item with engraving. Add the information you would like added to the board in the note field as you check out, or start a convo. Some engraving may require an additional fee, depending on the complexity of the request, but I'll fully inform you of any added cost. All sizes are provided in my shop listings. Measurements are nominal. The length and width may vary by 1/4" larger or smaller. The thickness may vary by 1/8" from the stated listing. If you need a board with exact measurements, let us know! We welcome both wholesale and corporate orders. We can customize our items with your logo, or create something just for you! Do you provide custom engraving services? 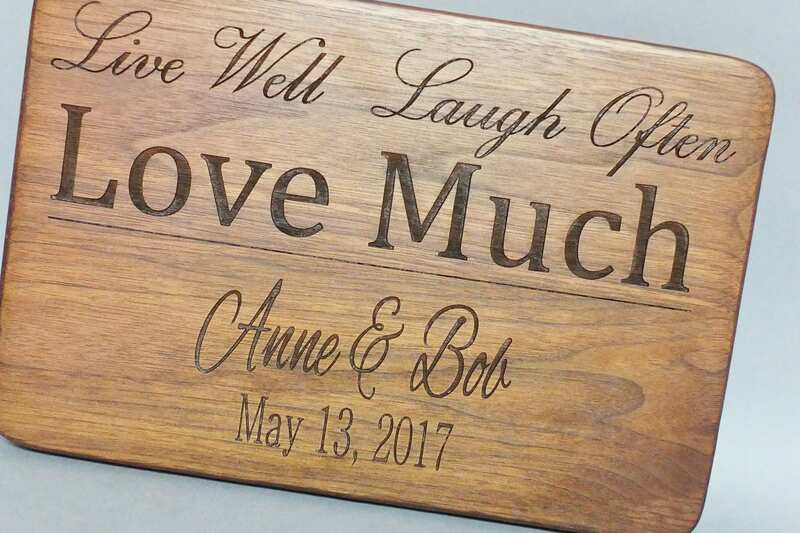 We will custom engrave your wood items. Start a conversation to determine turn around time and cost.